Brand integrations, if done well, create a great connect with audiences and is the perfect mode to increase awareness leveraging the content and reach that a publisher offers. Here is a look at a couple of branded programs I discovered in the last few weeks. Ebay continues to provide a platform for brands to create offers and deal zones. Starting out during the Festive Season, Airtel is giving its post-paid customers Ebay Shopping discount vouchers of upto 5%. A basic one-pager on Ebay calls out the promo which is on till 31st December. This co-branded destination is a template for how brand/concept integrations should be done. 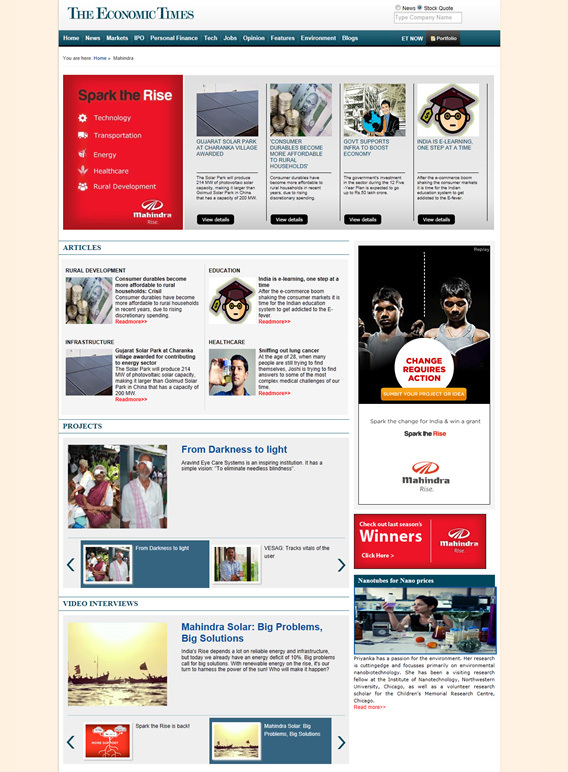 The channel brings together curated thematic content from ET including articles and related news items and brings together some content from the Mahindra Rise website including project details, videos and a banner plug that calls for new entries for ‘Spark the Rise’. This is the second Mahindra Rise publisher integration and my favourite still remains the Yahoo! execution, but the layout and content integration is just great.